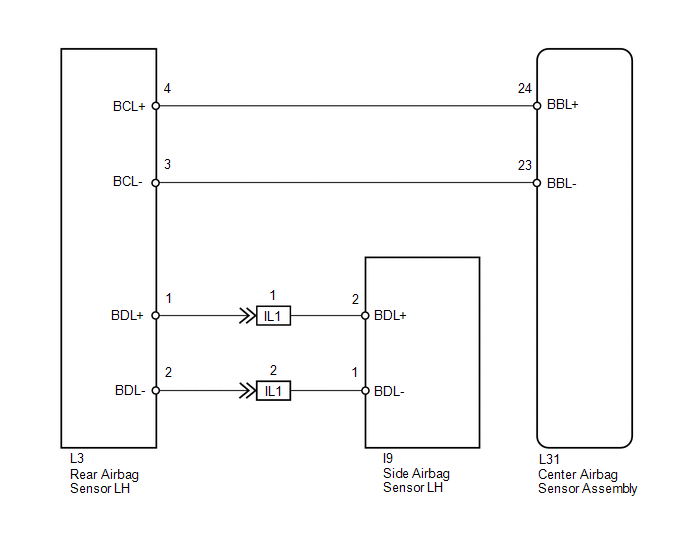 The rear airbag sensor LH and side airbag sensor LH detect impacts to the vehicle and send signals to the center airbag sensor assembly to determine if the airbag should be deployed. These DTCs are stored when a malfunction is detected for the side collision sensor LH circuit (to determine deployment of the front seat side airbag assembly LH and curtain shield airbag assembly LH). The center airbag sensor assembly receives a line short circuit signal, an open circuit signal, a short circuit to ground signal or a short circuit to B+ signal in the side collision sensor LH circuit (to determine deployment of the front seat side airbag assembly LH and curtain shield airbag assembly LH). (b) Check for current DTCs (See page ). Current DTC B1638 is output. Current DTC B1647 or 82 is output. Current DTC B1697 or B1698 is output. Current DTC B1637 is output. Current DTC B1637, B1638, B1647, B1697, B1698 or 82 is not output. Codes other than current DTCs B1637, B1638, B1647, B1697, B1698 and 82 may be output at this time, but they are not related to this check. (b) Check for history DTCs (See page ). History DTC B1637 is not output. History DTC B1637 is output. Codes other than history DTC B1637 may be output at this time, but they are not related to this check. (c) Check that the connectors are properly connected to the center airbag sensor assembly, rear airbag sensor LH and side airbag sensor LH. Also check that the connectors that link the floor wire and front door wire LH are properly connected. 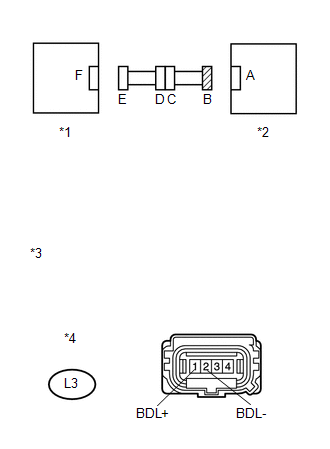 (d) Disconnect the connectors from the center airbag sensor assembly, rear airbag sensor LH and side airbag sensor LH. Also disconnect the connectors that link the floor wire and front door wire LH. 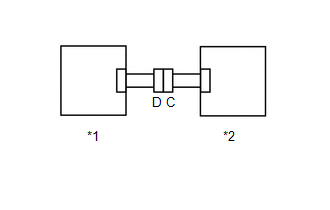 (a) Using SST, connect terminals 24 (BBL+) and 23 (BBL-) of connector B. (a) Connect the connectors that link the floor wire and front door wire LH. 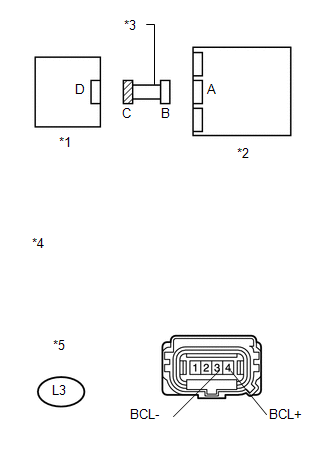 (b) Using SST, connect terminals 2 (BDL+) and 1 (BDL-) of connector E.
DTC B1638, B1647 or 82 is output. DTC B1633, B1642 or 81 is output. 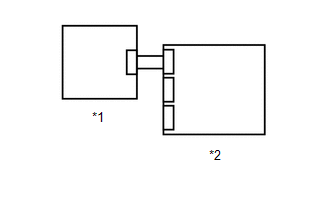 DTCs B1633, B1642 or 81 and B1638, B1647 or 82 are not output. (c) Return the rear airbag sensor RH and LH to their original positions and connect the connectors. (d) Interchange the side airbag sensor RH with LH and connect the connectors. (c) Check that the connectors are properly connected to the rear airbag sensor LH and side airbag sensor LH. Also check that the connectors that link the floor wire and front door wire LH are properly connected. (d) Disconnect the connectors from the rear airbag sensor LH and side airbag sensor LH. Also disconnect the connectors that link the floor wire and front door wire LH. (a) Connect the connectors to the rear airbag sensor LH. (b) Interchange the side airbag sensor RH with LH and connect the connectors. DTCs B1692, B1693, B1697 and B1698 are not output. (c) Return the side airbag sensor RH and LH to their original positions and connect the connectors. (d) Interchange the rear airbag sensor RH with LH and connect the connectors to them. (a) Disconnect the front door wire LH connector from the floor wire. (c) Disconnect the front door wire LH connector from the floor wire.